You know when summer is here in the PNW when all the farmers’ markets have their berries out. It all starts with strawberries in early June, then blueberries, raspberries and blackberries. 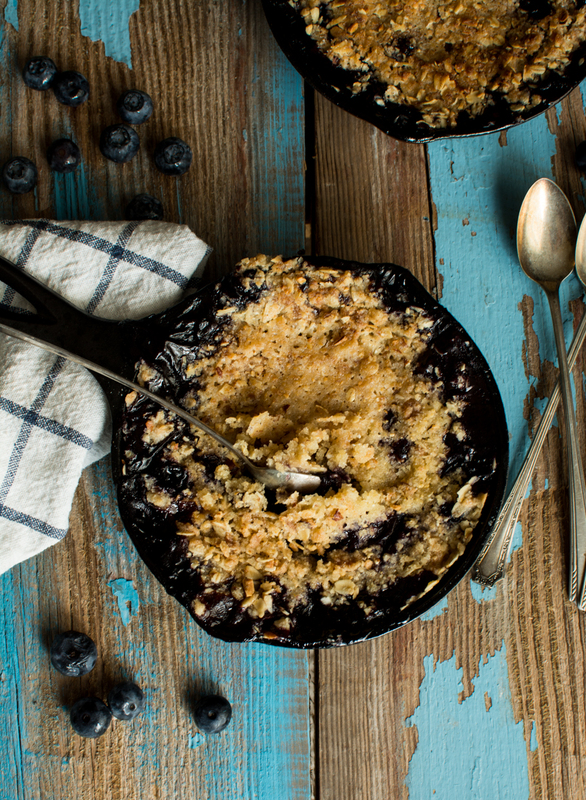 Blueberries are so versatile, they make fabulous waffles, awesome muffins, and a very tasty crumble such as this one. I also love to put them in my greek yogurt with a little bit of honey! Summer is soooo delicious! I wanted to scale down my recipe a bit for 2-3 people. Leftovers can be dangerous when they are desserts…if you know what I mean! 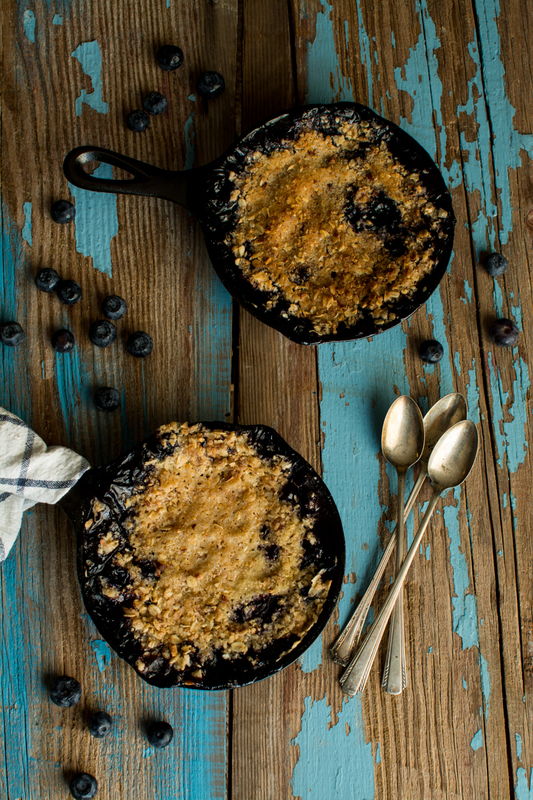 So I decided to bake this crumble in my mini lodge skillets. They are the cutest thing, really! I found them at a camping store, and I’m sure Amazon sells them too. You could easily put this into a 8×8 baking dish also…any oven proof vessel would work. 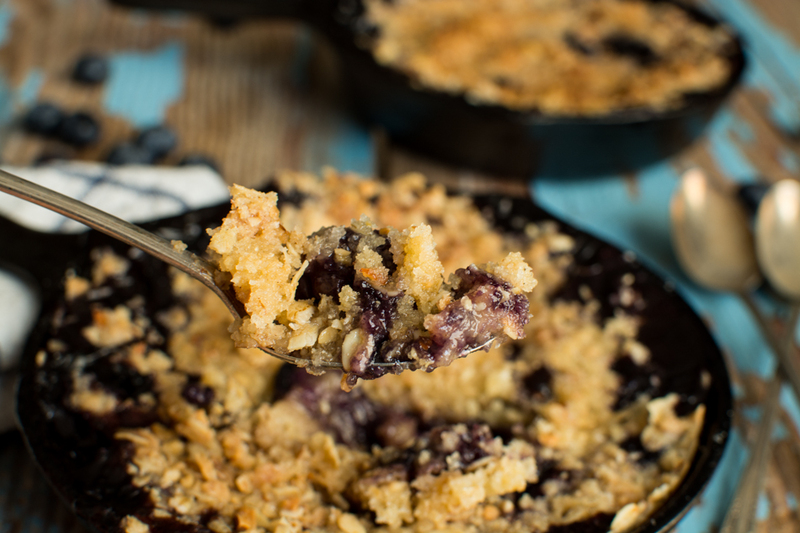 Oh, and this crumble can be ready to devour in a little over one hour, minus the cooling time. 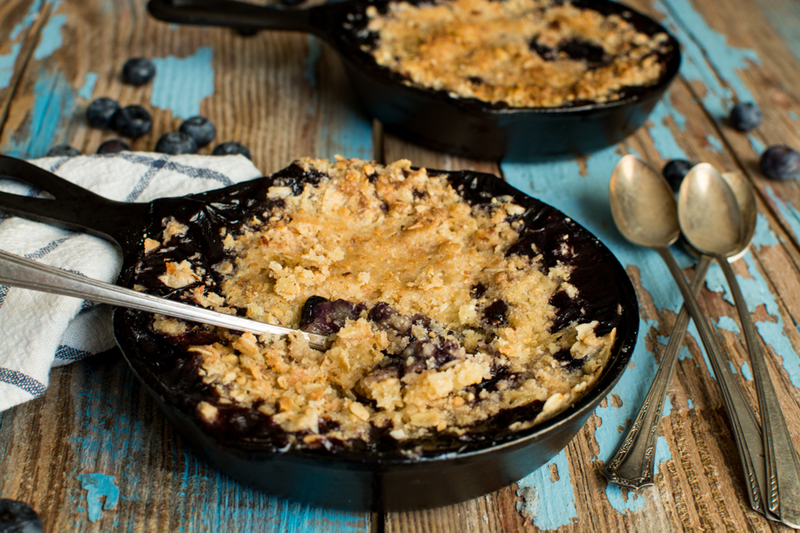 It’s very very hard to wait for the crumble to cool so you can dig in with a couple of spoons. And while you’re at, why not top it with some vanilla bean ice cream… I mean it is summer right? Preheat oven to 350 degrees, Butter your baking dish. In a large bowl, mix all dry ingredients together. Add cold butter and with a pastry cutter, cut into mixture until crumbly. Refrigerate topping for 15 minutes. Rinse berries and toss in a bowl with vanilla. Layer berries in baking dish. Add crumble topping over berries, it will look like a lot of topping, but will melt down as it bakes. Bake for 1 hour, until nice and bubbly. OMGGGG YUM! Loving your photos. Great job. I concur, yummy and amazing photos!